I have found help on how to make a heart frame with aluminium rod. I am wrapping this in air filled 5" balloons and i would like to hang this from the ceiling. I have seen this mentioned on most sites, but no help/ tips on how it is done. Please help. The party is next week. Comments for How do i hang a framed balloon heart to a ceiling? The easiest way would of course be to attach the balloon heart to existing fixtures on the ceiling (e.g. a hook). If there are no suitable fixtures, you could try the 3-M poster hanger hooks. When you want to remove the hook, you simply pull downward and it completely releases from the wall surface. But be sure to find out what weight they can support. 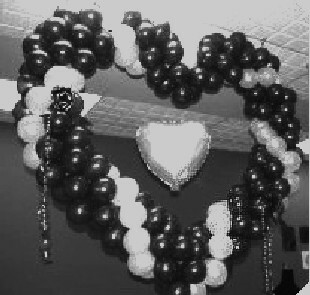 More information on hanging balloon decorations from walls and ceilings can be found at Balloonhq.com. If you have a ceiling with metal frames / structures, the MagMover magnetic hanging system could be an easy and elegant solution. Hope that helps. I would love to see a photo of your work. Simply submit your picture at the Balloony FAQ page.